Compared to the competition, Vertiv Avocent ACS 8000 offers stringent security via authentication, authorization and auditing features. Vertiv Avocent has a strong reputation for reliability. Many of our customers have reported up to 10+ years of continuous operation with the ACS. Customers choose us because they can “set it and forget it” until they need it. In the event of a network outage, customers can rely on the ACS to provide remote in-band and out-of-band access so they can identify the issue and keep their data center running. Every data center manager must balance the cost of security, access, and availability; and one of the most expensive cost factors is personnel. 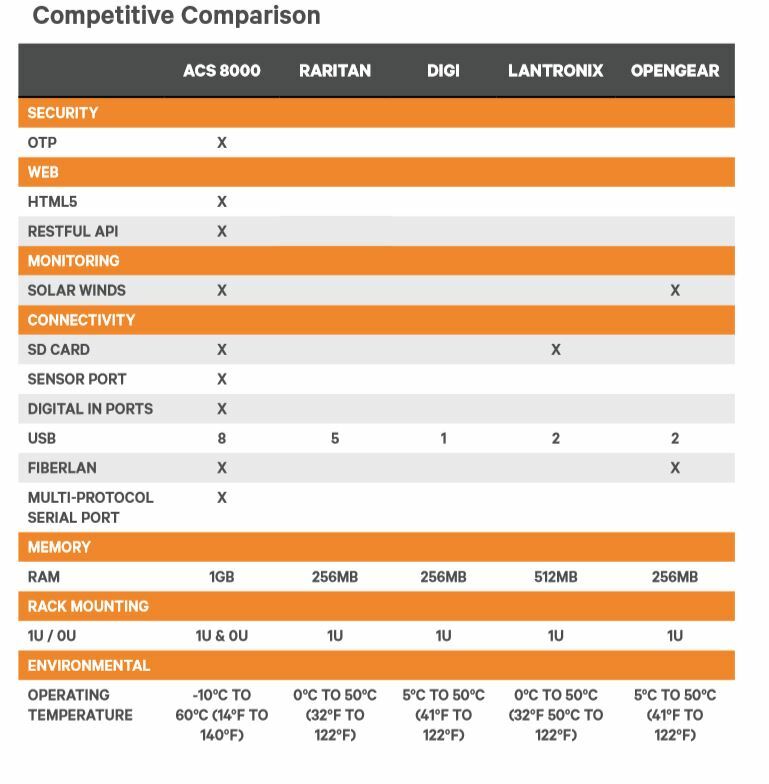 The Vertiv Avocent ACS 8000 provides several ease of use features that the competition can’t match. For example, the Zero Touch Provisioning (ZTP) feature of the ACS 8000 is expected to reduce installation time by up to 15 minutes per console. Depending on the number of consoles being provisioned, this feature alone can save a significant amount of time and money. Every datacenter is different and Vertiv Avocent offers tools to help customers centrally manage their multi-vendor environment. The powerful combination of the Vertiv Avocent ACS 8000 and DSView 4 Management Software offers access and control of any (physically or virtually) connected device, all from a single interface. Moreover, Vertiv’s unique hub and spoke architecture helps ensure availability of critical customer resources. -Simplicity and standardization of processes and security with out-of-box LDAP, AD, NT domain, TACACS+, RADIUS with RSA SecurID and 2048 SSL certificate authentication. -Unified, secure, “hands-on” control of geographically dispersed data centers and branch office infrastructure, enabling customers to manage operations from any location. – Hub-spoke architecture that allows high availability, redundancy and distributed access to achieve business continuity. -Access and control for other management devices including service processors (iLo, iDrac, IMM, RSA), KVM, console ports (Telnet, PuTTY or MIB) and rack PDUs.